Matrix Oil Wonders Indian Amla is one of the three versions in the oriental hair care series. It is intended for brittle, weak, damaged and sensitive hair. Its main ingredient is an extract from Indian gooseberry (amla). It is enriched with extra substances. Such a combination ensures softness and smoothness of your hair. … are based only on the properties of two active ingredients so the cosmetic definitely doesn’t provide an intensive treatment. Theoretically, it guarantees hair repair. In reality, the regeneration is not at all effective. Matrix Oil Wonders Indian Amla works on the hair surface rather than in the internal structure: it brings softness and smoothness and intensifies shine. If you use too much, it can weigh down and make the hair greasy. It works more like a styling serum than a strengthening hair oil. … is based on silicones and harmful alcohols that speed up the loss of valuable water. Natural ingredients can be found in trace amounts. The list of ingredients is very short so one would think the cosmetic is safe. Nothing further from the truth. Even small quantities of harmful substances turn out to be potentially damaging and simply unnecessary. Matrix Oil Wonders Indian Amla is not natural. It doesn’t contain any oils so calling it a hair oil is a bit misleading. … is very runny. Its consistency doesn’t resemble natural oils. The reason might be it is devoid of oils. The clear and fluid formula is well absorbed in the hair. The colour of Matrix Oil Wonders Indian Amla is rather normal but its aroma is more characteristic. If you don’t like gingerbread, the spicy and intense scent of the product won’t appeal to you. It will be pleasant for those who like strong aromas. … won’t be problematic for anyone. You apply a small amount of the oil to dry or damp hair – it is up to you. 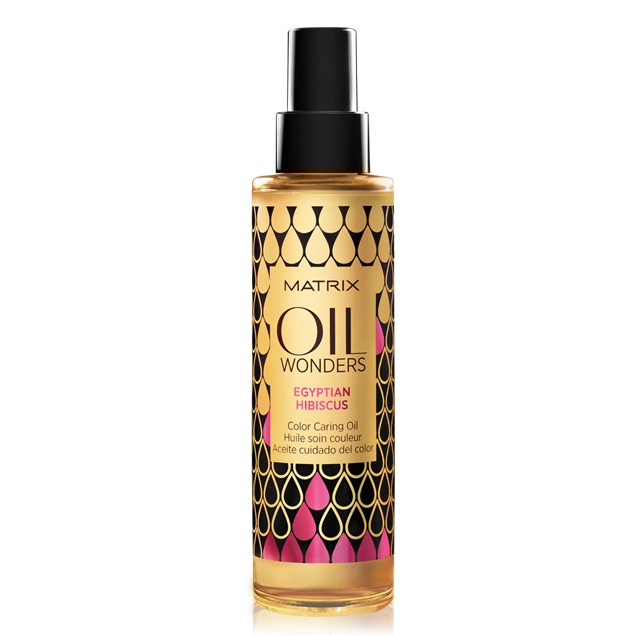 Matrix Oil Wonders doesn’t need to be rinsed out. It is recommended to use the oil together with Matrix conditioner, which is supposed to give better results. It might be a problem if you have only one Matrix product. An important piece of information: the oil is unsuitable for the scalp care. … is a cylindric standard-size bottle, made of a thin plastic. Surely, it is not a container that effectively secures the liquid. You can see the oil through the semitransparent walls of the bottle. The name of the brand and product is placed on the label surrounded by graphic drops. Gold and black are the dominant colours.